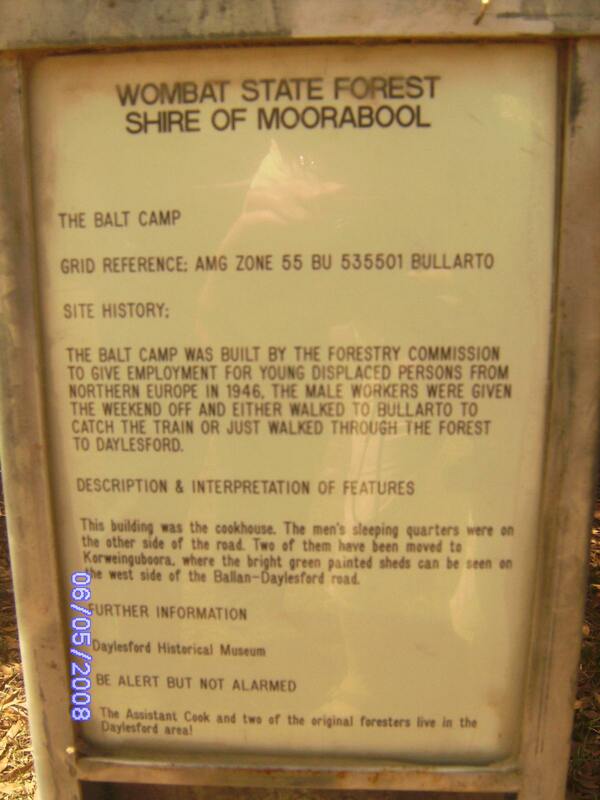 The Balt Camp was situated in Camp Road, Bullarto, north of Blackwood. The Balt Camp – grid ref – AMG 55 BU 535501 Bullarto. 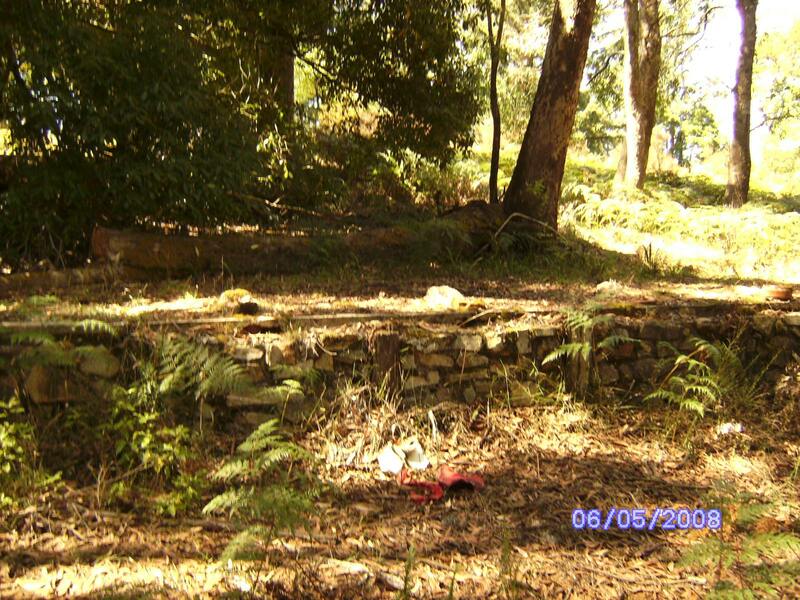 THE BALT CAMP AND ABLE’S MINE, BULLARTO, NEAR BLACKWOOD. 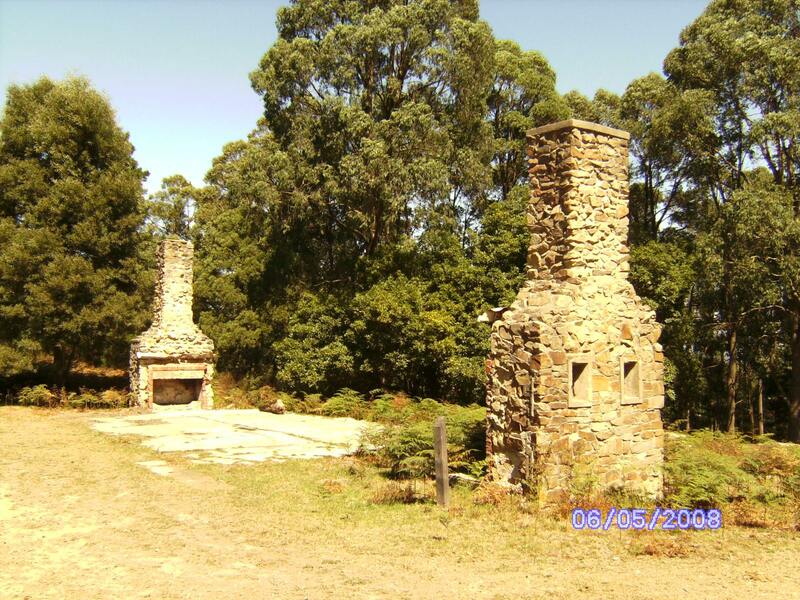 I have been asked by the Blackwood Historical Society to do some research on the Balt Camp and Able’s Mine in Bullarto where recent publicity has shown that permission has been given to Fortitude Mining to start mining in the area. The Balt camp is on one side of the road and Able’s Mine on the other side in Bullarto. 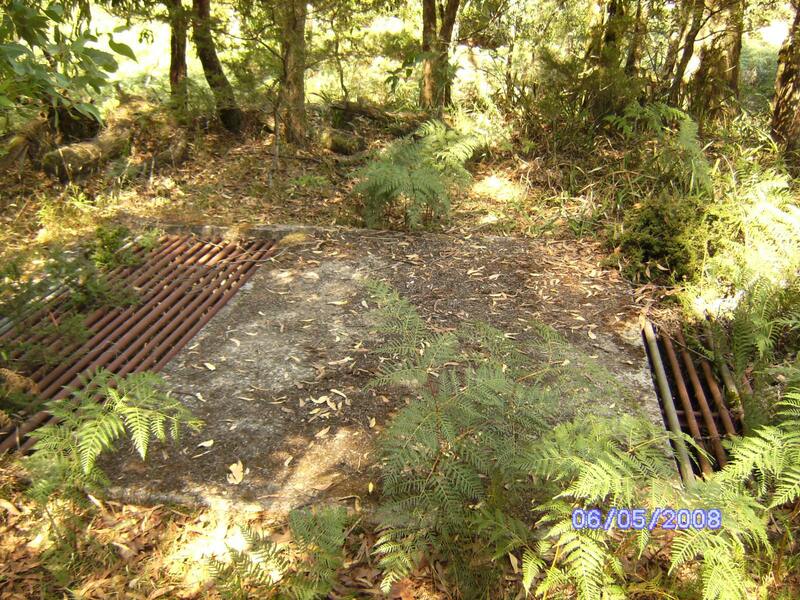 Two grates over the Able Mine. Camp Road, Bullarto. This walk takes you from the Balt Camp – on Camp Road – down into the catchment and headwaters of the Lerderderg River. There are some good views, some ferny gullies and some older trees on parts this walk. There is also some unusual, stunted high-altitude vegetation – including stands of Hakea on rocky ridges, exposed to seasonal extremes of temperature and moisture. Access to the Balt Camp is from the east via the Spargo – Blakeville and Camp Roads, or via camp Road from Bullarto South. 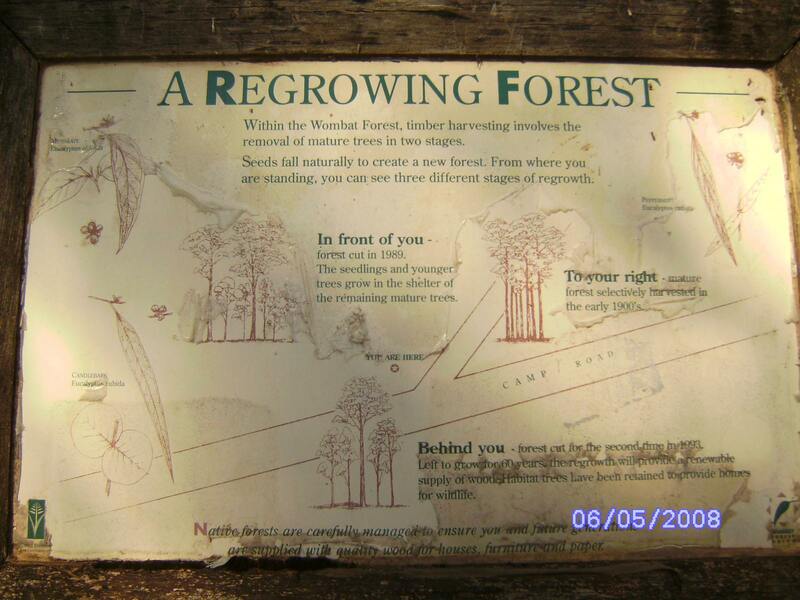 Sign on side of road with information on local forest Re-growth. Found on Trove in the West Australian paper -Monday 27 October 1947. BALT REFUGEES AS MIGRANTS – Arrival at Fremantle in December . The first party of 860 displaced persons would arrive in Australia early in December, the Minister for Immigration (Mr. Calwell) announced today. They were all of Baltic origin and had been instructed in the English language and the Australian way of life at a camp near Berlin. This instruction would be continued on the voyage and in Bonegilla camp, Victoria, where they would stay for a month before being allotted to employment in the various States. Balt Camp showing two chimneys and concrete base of hut. 2008. 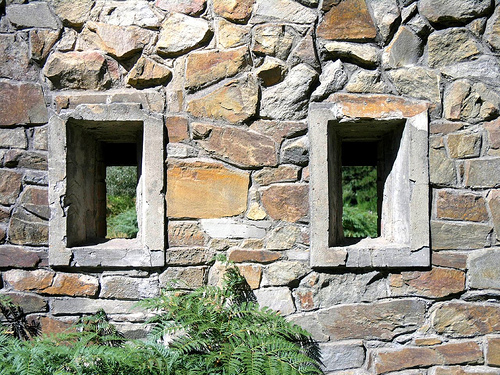 Balt camp ruins showing end wall and windows with well made stone work. After World War Two Australia agreed to provide a new home to many people from Europe who had become refugees because of the war. The first ‘displaced persons’ came from the Baltic countries – Lithuania, Latvia and Estonia. There were 843 people in the first group to arrive in Australia in 1947. This was the beginning of a large-scale immigration program. Many Australians felt that the population needed to grow so that the country could defend itself better, and have enough people to fill all the jobs that were available. Most of the refugees from World War Two arrived during 1949 and 1950. The one millionth person to migrate to Australia after World War Two was Mrs Barbara Porritt, who arrived with her husband in Australia on 8 November 1955. In the previous decade the makeup of the population had changed dramatically. In about 1945, more than 7 in 10 Australians were from a British background. By 1955 this proportion had dropped to approximately 5 in 10 Australians. As more and more people migrated to Australia, bringing with them a rich variety of cultures and skills, the proportion continued to drop, to a little over 3 in 10 Australians. Or another site re. 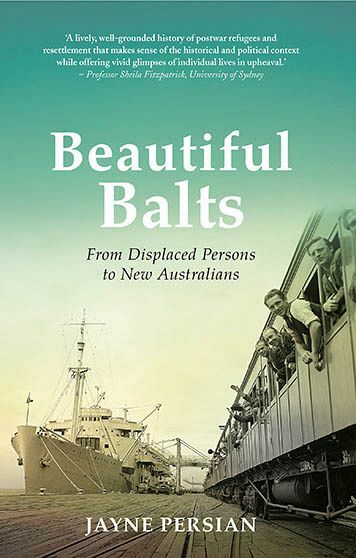 a book written about the Balt camps – Kevin Bain shares his thoughts on Jayne Persian’s book on post-WW2 immigration, ‘Beautiful Balts: From Displaced Persons to New Australians’ and what we can learn from it today. Ben Chifley, swiftly gave his approval and about 170,000 displaced persons came to Australia between 1947-52, mainly from Poland, the Baltic states, Yugoslavia, Ukraine, Hungary, Czechoslovakia and Russia. For the New World recruiters, blonde, blue-eyed Baltic people were the cream of the crop and Jews were not — a racism rationalised by Anglo Australia as preserving harmony. The Balt Camp was built by the Forestry Commission to give employment for young displaced persons from Northern Europe in 1946. The male workers were given the weekend off and either walked to Bullarto to catch the train or just walked through the forest to Daylesford. This building was the cookhouse. The men’s sleeping quarters were on the other side of the road. Two of them have been removed to Korweinguboora where the bright green painted sheds can be seen on the west side of the Ballan-Daylesford road. Commemorates Balt Camp which was a refugee work camp for displaced persons from World War Two, including those from the Baltic States. 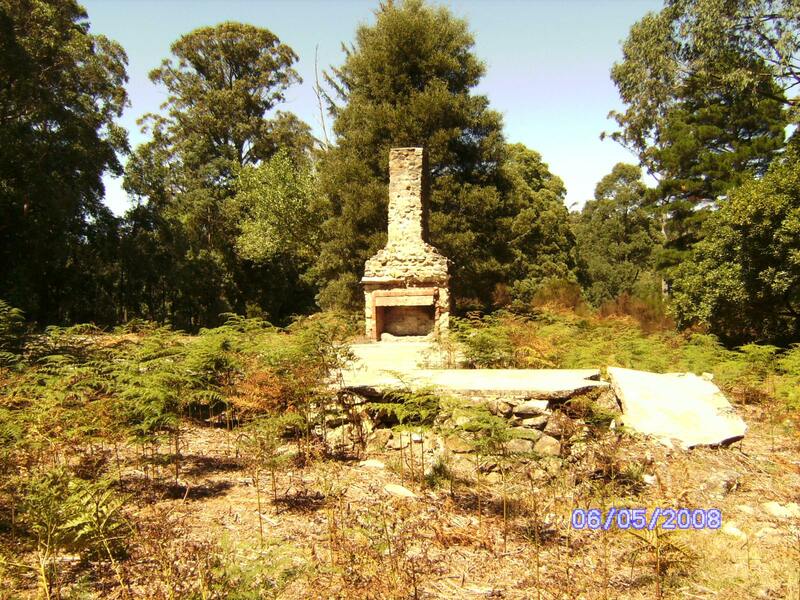 The Forestry Commission constructed the camp in 1946. ABLE MINE – Opposite Balt camp, Camp road. 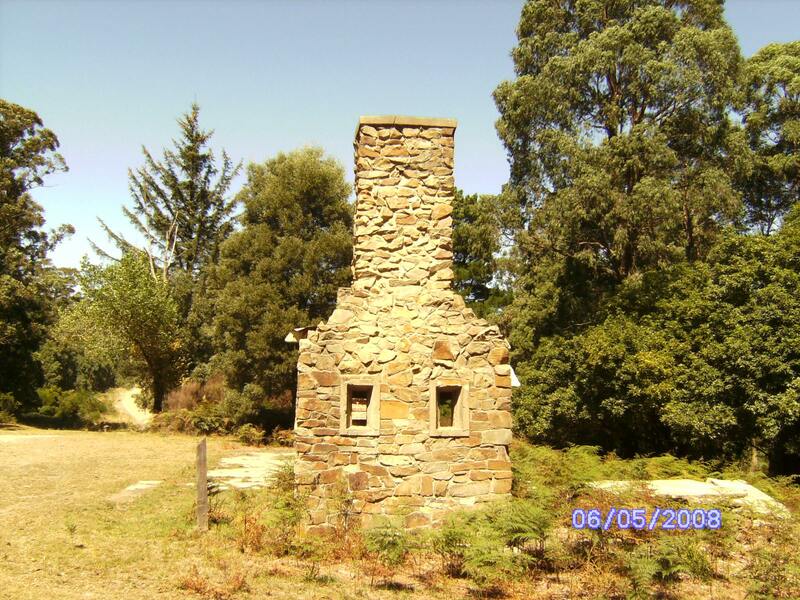 Bullarto, north of Blackwood. 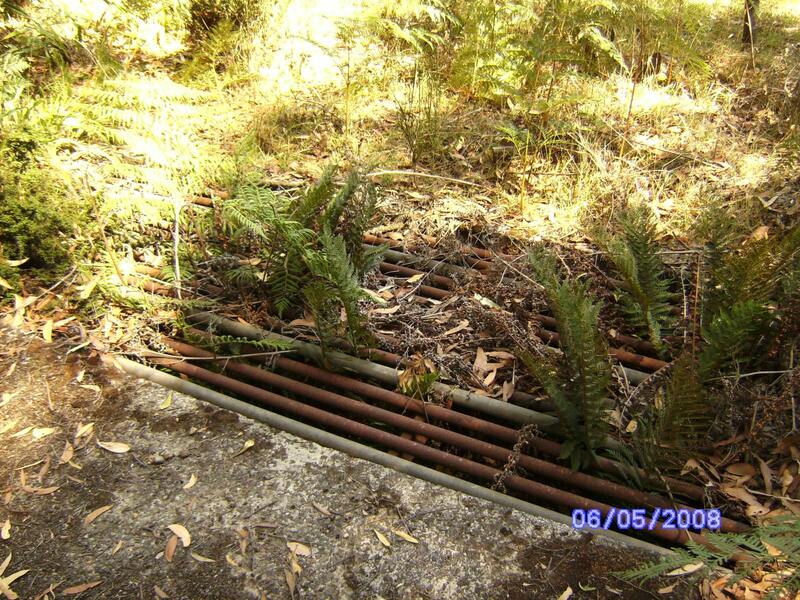 Grates over Able Mine, Camp Road, Bullarto – north of blackwood. 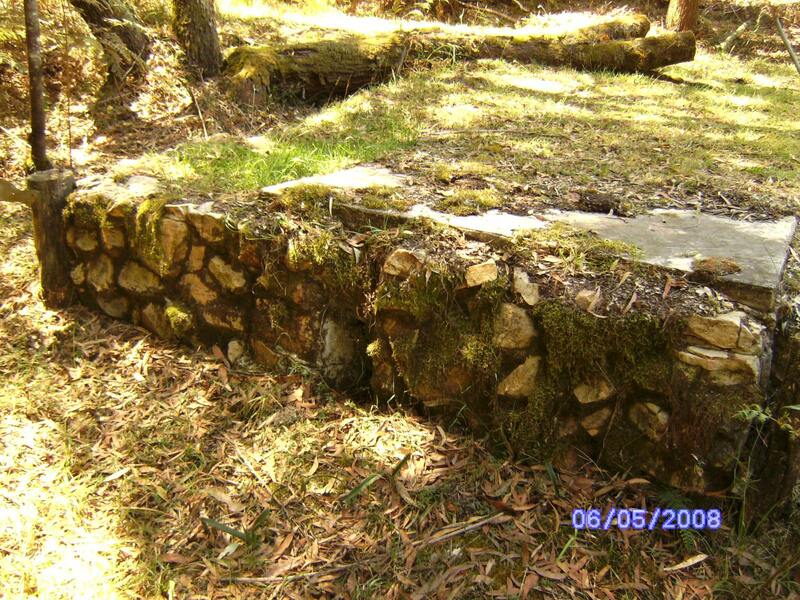 Photo found on facebook – The Victorian Historical Mine Shaft Casers. Inc. written on the site regarding this photo by Dennis Kied from Blackwood – “Back in the early 1990s the entrance had fly screen woven mesh so most likely was used as a cool store for the Balt camp that was above.” Someone else said the tunnel could have been used as a fire refuge with the concrete walls. On researching the Able mine on the Internet I found it was called Able’s Mine. 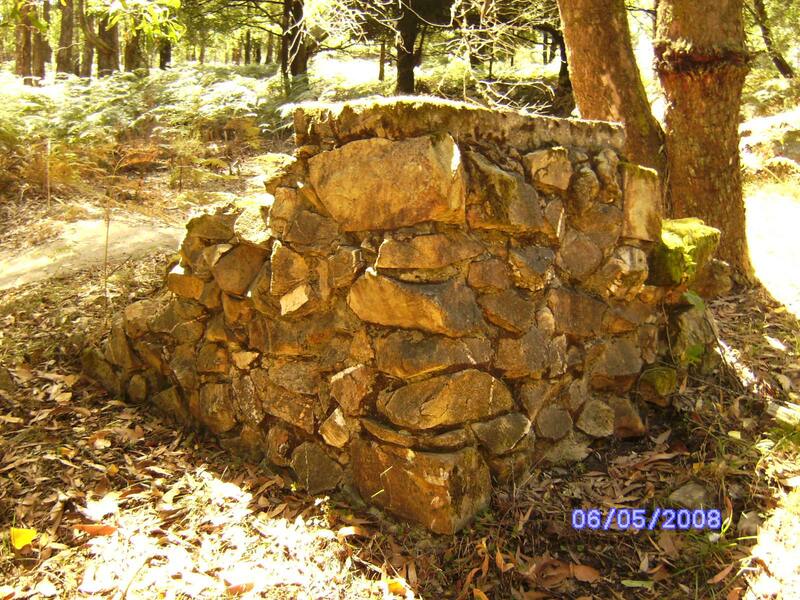 Records show it was an active mine 105 years ago in Bullarto, north of Blackwood. Abel’s Reef Bullarto, 21st – extended north drive 21 ft from old end. Total from cross-cut 56 ft., North end improving. Making a bit more stone in leaders; coarse colours occasionally. The managers report – Abel’s Reef, Bullarto – 25th -Started battery, difficulty with water suspended to erect storage tank 4,000 gallons. Started crushing again. Should be able to crush one shift regularly. Stopes looking well. Putting through 50 tons. The mangers report – Abel’s Reef Bullarto, 22nd – Extended stone north from rise 16 ft payable stone 18in; started another stope under this one, 10ft., payable stone 10in., Bottom of stope 30ft from top of bottom north level. Rise when starting to break stone, was 45 ft high making 15ft of stone stoped out when these two stopes get through the shoot north height of shoot, here 25ft to 30ft; about 70ft or 80ft long. Stone going strongly underfoot on level, prospects payable. The Abel’s Reef Gold mining Bullarto, March 10th – The 2nd half-yearly general meeting of shareholders was held at the registered office, in Queen street. Over half the shares were represented Mr L Rees presided. The report and balance sheet were adopted. The retiring directors (L Rees and J Bentley) were re-eleceted. The mine manager througly recommended driving a tunnel, as it would enable the lease to be thoroughly and more economicallv worked. He estimated the cost to be about £255, and the saving over 2dwt per ton. A long discussion took place, and it was thought that two calls would be enough to meet the costs. the recommendation was therefore adopted. A fire between Blakeville and Bullarto wrought much damage at the Abel’s Reef mine. It destroyed the poppet legs and a tool house, also Mr. Stephens’s house adjoining. The engine-room was scorched, but saved. The principal interest in the claim is held by Mr. Stephens and three sons, whose loss, after a struggle in advancing the mine so far, is considerable. July 16, 2012. 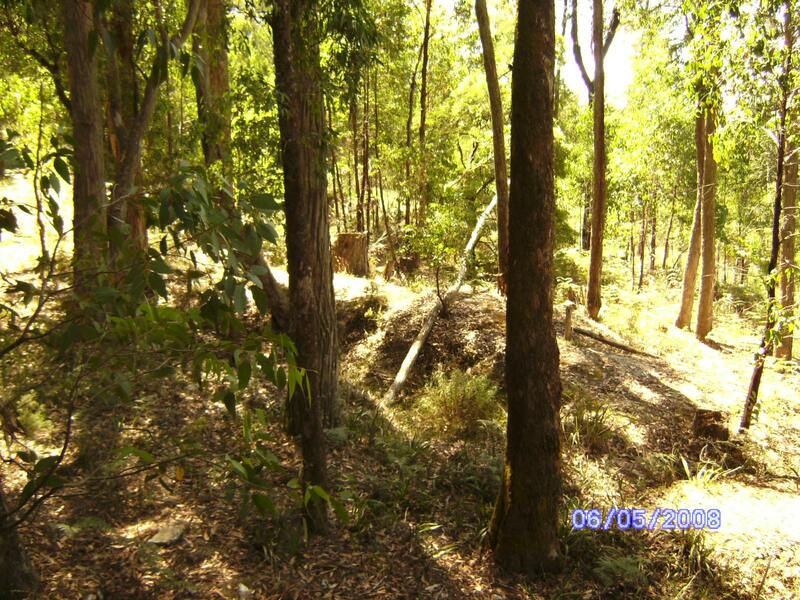 – Fortititude Mining chief, Lyle Palmer has forwarded to the ABC a fact sheet on the proposed mining process at the site in the Wombat Forest. 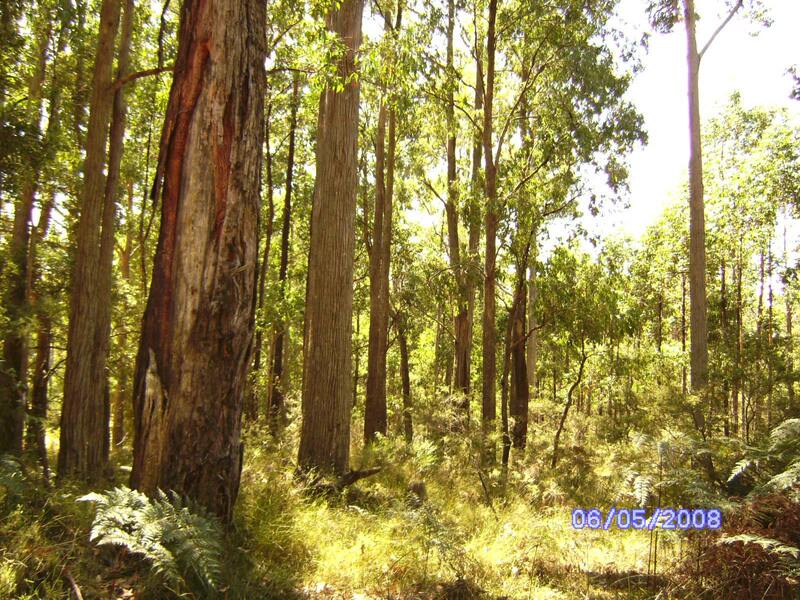 The license, of 5 ha is located in the Wombat State Forest approximately 3 kilometres south of the village of Bullarto, near Daylesford Victoria. It is between Camp Road, Lerderderg track and Maxwell Track. The mineral resource, known as Abel’s Reef was mined around the end of the 19th century and early 1900s. 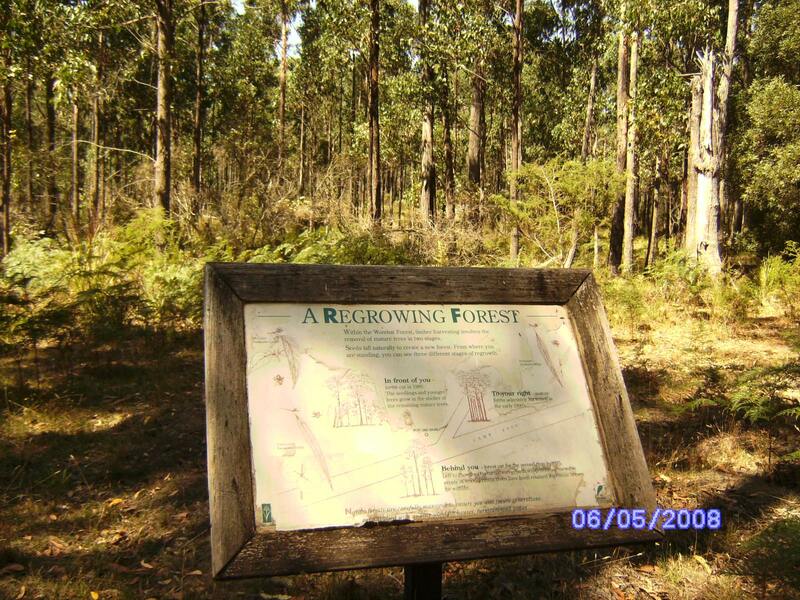 The site also has a recorded history of disturbance due to numerous logging campaigns for the harvesting of timber. 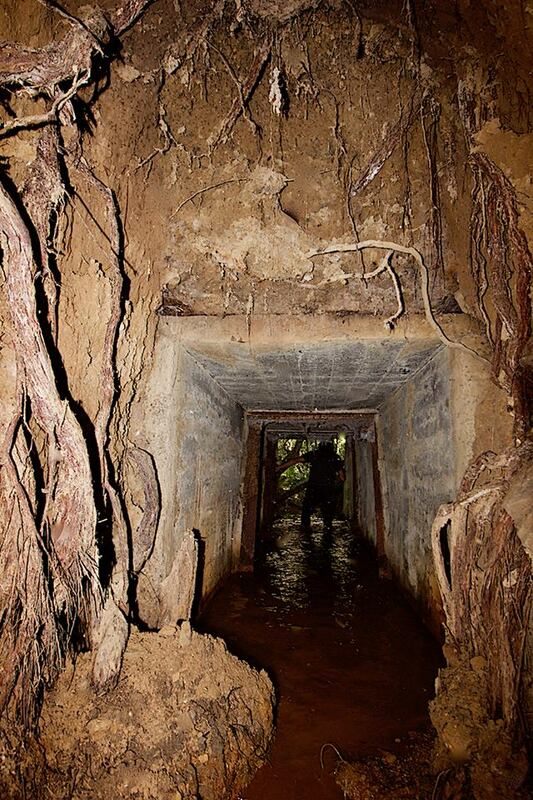 There are as many as twenty open shafts of various depths on the license and it is quite hazardous for persons to move through or around the area unescorted. An application for a mining license was made on the 16th July 2001 and five years ago on the 18th July, a mining license (MIN 5349) was issued over an area of 5ha, to Mr. Neil F Stuart and Mr. Barry G Friend. The application for this license was preceded by over ten years of exploration, conducted under an exploration license. An estimate of the expenditure from that period and up to the present would be that well in excess of $500.000.00 has been spent on work including mapping, sampling, drilling, assaying and administration expenses. An “indicated “ resource of 120,000 tonnes of ore at a grade of 3.4 grams of gold per tonne of ore has been estimated to exist to shallow depth at Abel’s Reef. These grades are quite “skinny” and there is considerable doubt as to the presence of much the remnant reef. It is thought that the “old timers” may have taken out much more of the reef than some assumptions allow for. For these reasons we think that it would not be at all prudent to commit to mining a large portion of the estimated resource. With this in mind, a work plan was prepared which proposed excavating a selected bulk sample of 5000 tonnes, along the reef ,within 20 metres of the surface. The intention is to have this ore toll treated off site. Following a rigorous assessment of the impact such an operation would have on the area, approval of the work plan was recently granted by the Dept. of Primary Industries. A flora and fauna assessment was used to guide the Department of sustainability and Environment in determining the offset ratio, which stipulates a proportional area of land (containing a similar habitat) that we must ‘lock up” in perpetuity to achieve a net gain. In this case we need to secure by covenant an area which is 150% of that which we clear for the excavation of the bulk sample. We also need to fully rehabilitate the cleared portion of the license area. An area of vegetation along the line of reef will be cleared, the topsoil stockpiled and the overburden removed, followed by the excavation of 5000 tonnes of ore for treatment off site.